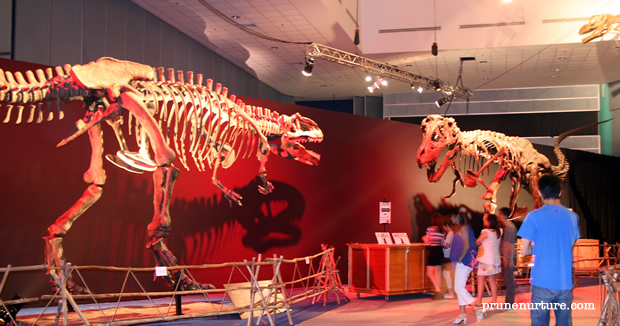 The 3,000 square meter exhibition at Singapore Science Centre displays dinosaurs and ice age mammals in their natural states, their growth and behaviours using animatronic effects. 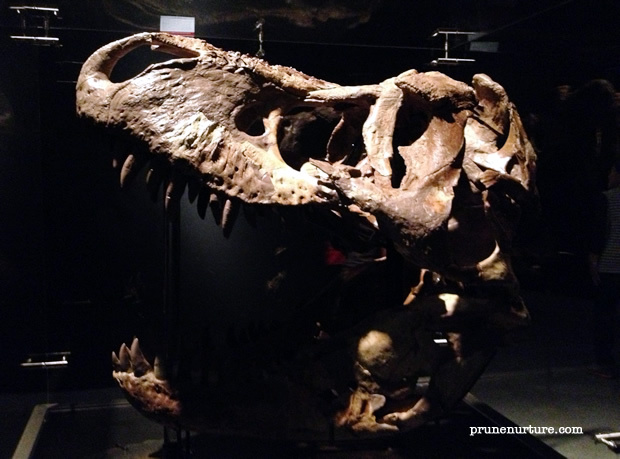 This exhibition is from The Museum of the Rockies (MOR) featuring the work of Dr Jack Horner, one of the world’s leading palaeontologists. 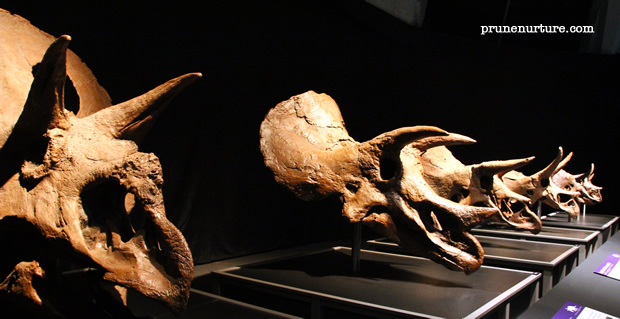 These exhibits display the growth and development of the Triceratops from a baby to an adult. The horns of the baby Triceratops pointed backwards and as it grew the horns pointed forward. 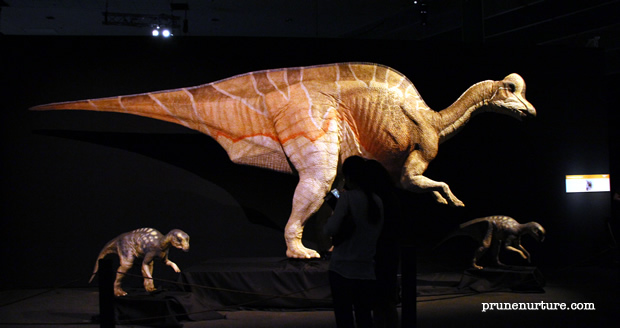 Hypacrosaurus stebingeri was a crested duck-billed dinosaur. It is one of the most completely known dinosaurs in the world because there are remains of it from all stages of life, from embryo to adult. 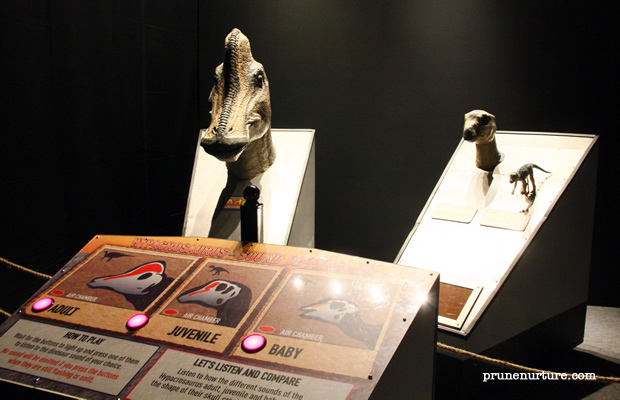 There is even a simulated sound produced by the baby, juvenile and adult Hypacrosaurus. 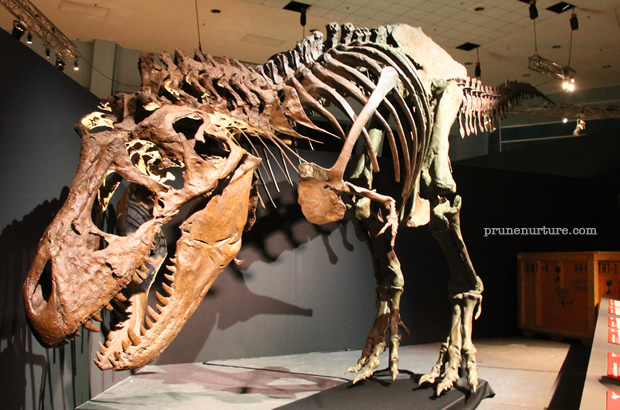 This is the largest real Tyrannosaurus rex (T. rex) skull ever discovered by scientists and the first to ever leave the US. It is valued at more than US$1.5 million. 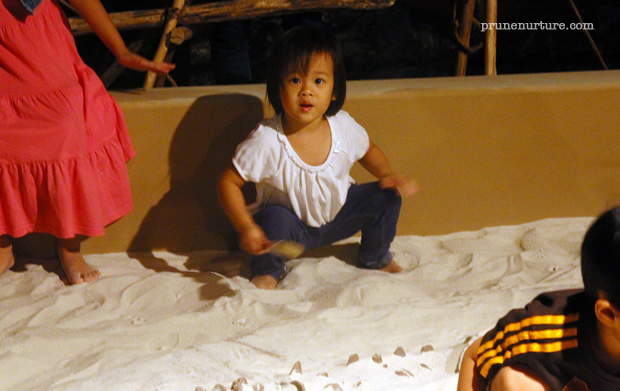 My little-paleontologist-to-be had so much fun at this children play area that she did not want to leave. 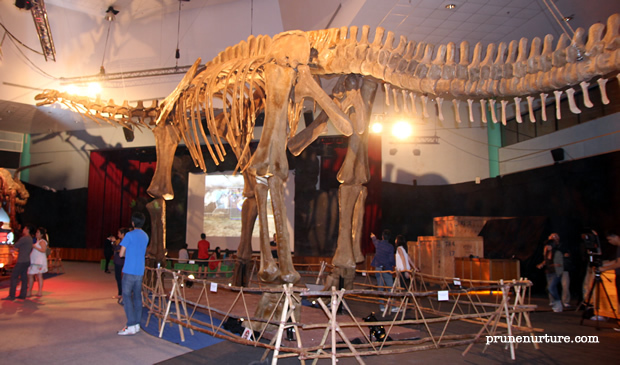 We also saw the life-size dinosaur skeletons and the 36-metre Argentinosaurus, the heaviest and largest known land animal to ever walk on earth. Dot tried to piece the puzzle pieces together. These ice age mammals lived in different time from the dinosaurs. These huge giants – dinosaurs and the ice age mammals – are fascinating to know but there are still many unknown as to how they went extinct. 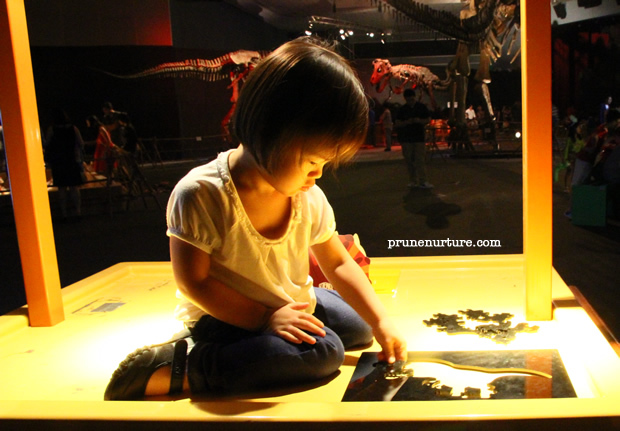 The children were still hanging around the dinosaur origami table, where Ms Wong Yit Chee, a staff from Science Centre was sitting, waiting for their dinosaur origami to be folded. 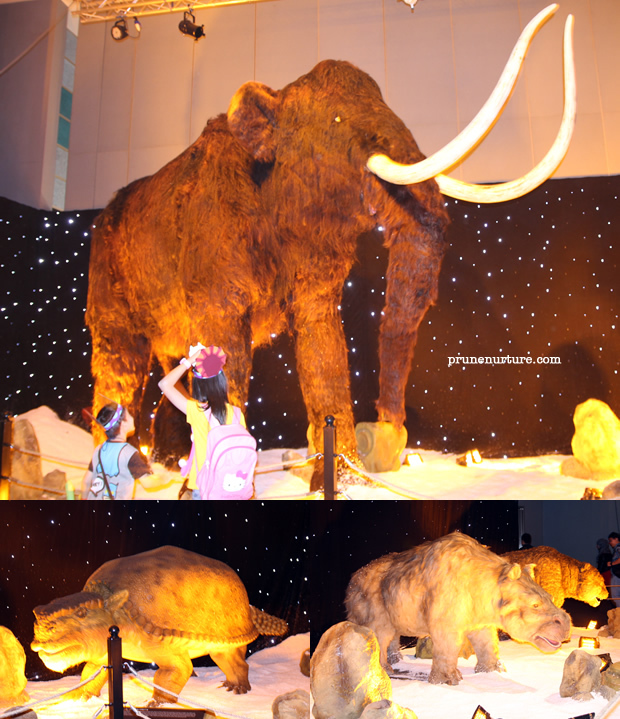 While we were waiting, Ms Wong shared with us the interesting findings about the dinosaurs and the ice-age mammals and the children’s adventure camp with dinosaurs for 9-12 years old on 6-7 December 2013. All of us really enjoyed our time at this exhibition.